"41AN1-38, Burial E-6" by Timothy K. Perttula and Robert Z. Selden Jr. VESSEL FORM: Jar with a direct rim and a rounded lip, small strap handles, and four legs on a ring or pedestal base. DECORATION: Vertical pinching on the vessel rim, four concentric circles comprised of curvilinear pinched rows across the body, and vertical pinching on the strap handles and the ring base legs. 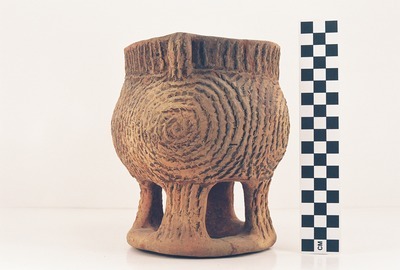 Killough Pinched jar (Vessel 41AN1-38).